Thanks for the printable version!! Rick Mears was a Redline Red not an Ultra-Violet SSR and the extra Ultra-Violet SSR was the Official Indy Pace Vehicle. When I bought my brand new '04 last June, I emailed GM Canada to get the info on how many purple were sold in Canada and they reply'd with a phone # to their vintage department and said it would cost me. At the time I had better things to spend my money on - like getting flaming rally stripes custom made for my SSR! Marc, Thanks for some Great Info. Another reason to be a member of this Community of SSr owners. I have a 2004 Ultra Violet the date on the door sticker indicates manufactured 12-03 and the vin # is 03550. One of the members said that is was manufactured January 7 04, If that was true why would GM put 12-03 0n the door sticker??? Thanks Marc for your effort. I've made copies and will save it but I don't know why. The FINAL 2006 Production History is HERE! I want to extend a BIG THANK YOU to both Bob Walczyk & Ann Daley for providing all of us SSRFanatics with the 2003-2006 SSR MY Final Production numbers. I also want to thank our great Canadian friend parothed97 for converting our Excel spread sheets into pdf files for easier saving, viewing and printing. Thanks Mark, By The Numbers My 06 Redline Red Is The 17th Built In The Final 2006 Production Run #23303. So if I add all the years of production, the total units are 24180. What is puzzling is that the final serial number if memory serves me right, and it doesn't always do that, was 24112. Thanks MarcNY, Bob and Ann, and parothed97. Now my printed versions are complete. Astounding numbers for Canada, and too bad just the two versions of the two-tone. I have answers to why there was only 24112 "regular production" recorded VIN#s SSRs produced vs. the total produced which was at 24180. I will take time at a later date to go over the whys for all those extra numbers and why some SSRs were never assigned a real VIN number. Wow...only 189 aqua blurs built in MY 2006! Very interesting stats. Thanks Marc! According to the production #'s, can we say there were 2,213 six speeds produced out of the 24,180 total production run? Just wanted to know if my math was right. Was the Two Tone paint option supposed to be available in 2005 also? I see an option code listed for two tone in the 2005 charts but none built??? Was the Two Tone paint option supposed to be available in 2005 also? I see an option code listed in the 2005 charts but none built??? I don't know, but hopefully if there is a member out there with an '05 Tu-Tone, they will added it to the registry. Hopefully our Canadian Tu-Tone owners will add theirs to the registry. Where to find the build date. Where can I find the build date of my final production run 06? The drivers door sticker just says 03-06. It's # 124073. 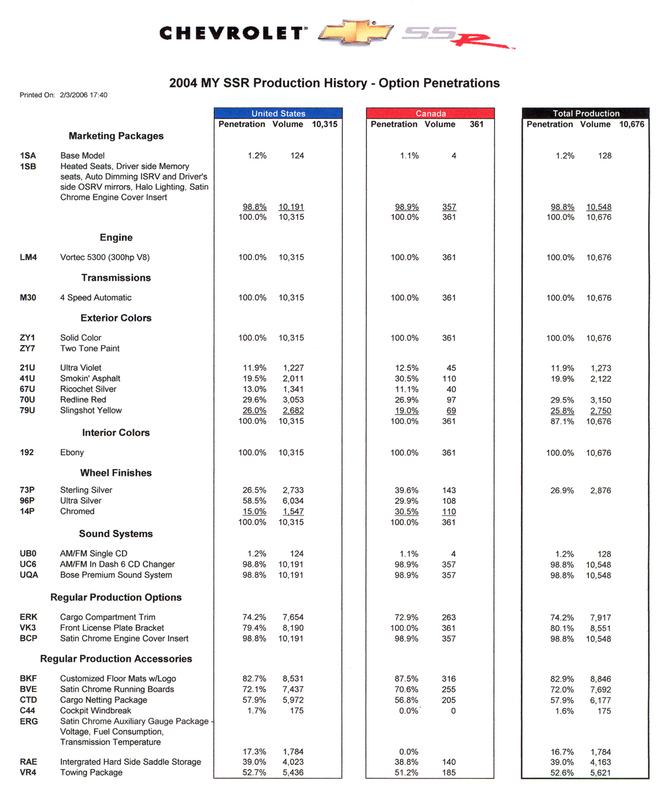 The Final 2003 - 06 Production numbers & Options history all in each years pdf files. Those that have been waiting to see the complete breakdown of options & history of their very own Model Year - 2003, 2004, 2005, 2006 SSRs here it is! Very interesting information, Marc NY . . .
Can someone attach thumbnail for the 2006 production registry please. We are just "window shopping" for now. Thanks a lot for posting the 2006 Production Registry for me. I appreciate your quick reply. Now I can start my "wish list". 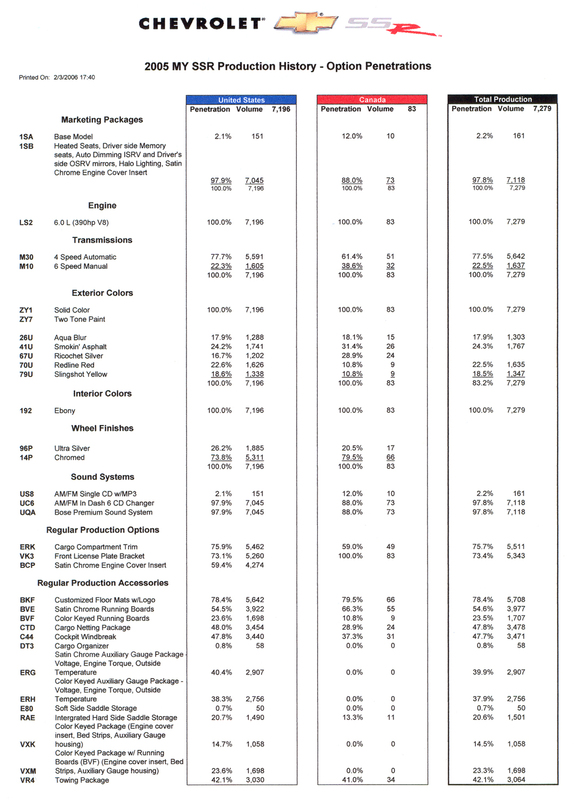 Thanks once again to Dan for helping make up a new pdf file of our "Revised" 2006 SSR Production numbers and list for all of us. 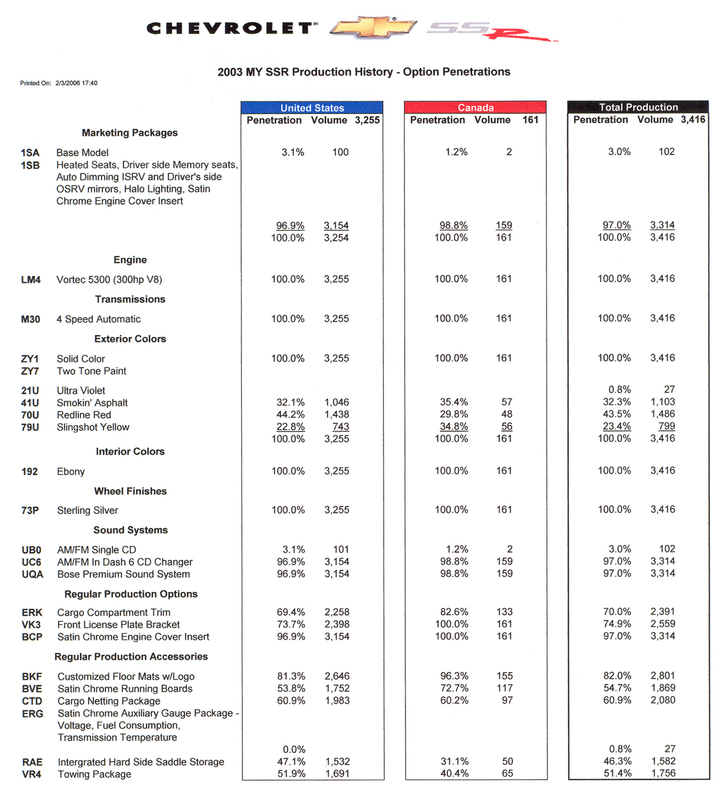 Please go and download our newest updated 2006 SSR MY Production figures.